Are you ready to make a super cute bobble shrug? Grab your yarn and grab your needles. This project is perfect for your holiday knitting. The big needles and super bulky yarn works up quickly. 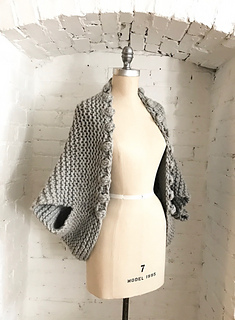 This shrug is also perfect for the transition from one season to the next and those cold office buildings. Shrug is 39 inches wide and 30 inches deep.